The ukulele chords are included. A traditional song from Northern Ireland, This version by Paddy Reilly. The tin whistle sheet music is included. 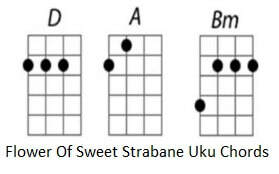 The second set of guitar chords are in the same key that Paddy Reilly plays the song in. The youtube video is of Paddy Reilly. The Flower of Sweet Stra[Cm]bane.